Of course, if you want to read my current diaries you’ll have to buy the magazine. 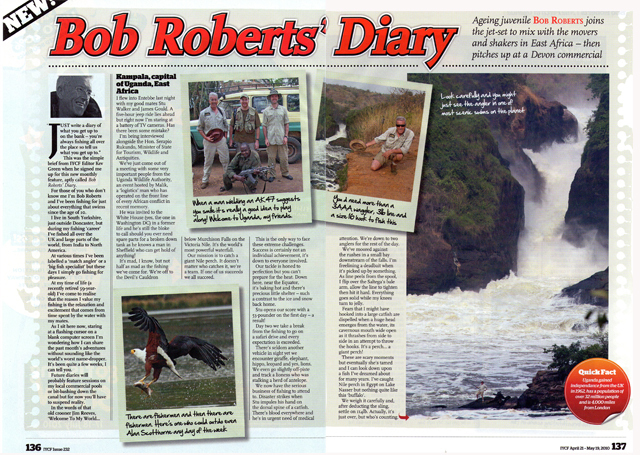 ‘Would you fancy writing a regular diary piece for Improve?’ Asked Kev. Kampala, Capital City of Uganda, East Africa. 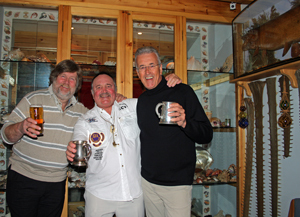 I flew in to Entebbe last night with my good mates Stu Walker and James Gould. A five hour jeep ride lies ahead but right now I’m staring at a battery of TV cameras. Has there been some mistake? 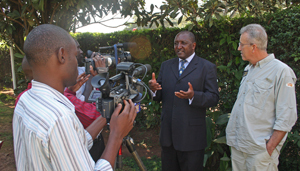 I’m being interviewed alongside the Hon. Serapio Rukundo, Minister of State for Tourism, Wildlife and Antiquities. We’ve just come out of a meeting with some very important people from the Uganda Wildlife Authority, an event hosted by Malik, a ‘logistics’ man who has operated on the front line of every African conflict in recent memory. He was invited to the Whitehouse (yes, the one in Washington DC) in a former life and he’s still the bloke to call should you ever need spare parts for a broken down tank as he knows a man in Sheffield who can get hold of anything! It’s mad, I know, but not half as mad as the fishing we’ve come for. 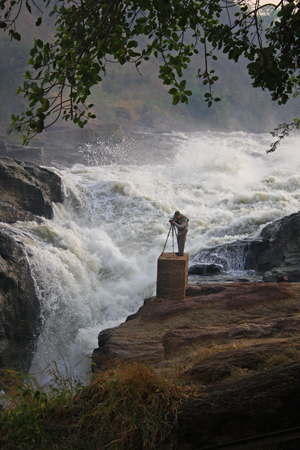 We’re heading for the Devils Cauldron below Murchison Falls on the Victoria Nile. It’s the world’s most powerful waterfall. Our mission is to catch a giant Nile perch. It doesn’t matter who catches it, we’re a team. If one of us succeeds we all succeed. It’s the only way to face these extreme challenges. Success is certainly not an individual achievement, it’s down to everyone involved. Our tackle is honed to perfection but you can’t prepare for the heat. Down here, near the Equator it’s baking hot and there’s precious little shelter – such a contrast to the ice and snow back home. Stu opens our score with a 53-pounder on the first day – a result! Day two we take a break from the fishing. Can you believe that? We go on a safari drive and every expectation is exceeded. There’s seldom another vehicle in sight yet we encounter giraffe, elephant, hippo, leopard and yes, lions. We even manage to go slightly off-piste and track a lioness who in turn is stalking a herd of antelope. Breathless we leave her in peace. We now have the serious business of fishing to attend to. Disaster strikes when Stu somehow manages to impale his hand on the dorsal spine of a catfish. There’s blood everywhere and he’s in urgent need of medical attention. We’re down to two anglers for the rest of the day. We’ve moored against the rushes in a small bay downstream of the falls. I’m free-lining a deadbait when it’s picked up by something. As line peels from the spool, I flip over the Saltega’s bale arm, allow the line to tighten and then hit it hard. Everything goes solid while my knees turn to jelly. Fears that I might have hooked into a large catfish are dispelled when a huge head emerges from the water, its cavernous mouth wide open as it thrashes from side to side in an attempt to throw the hooks. These are scary moments but eventually she’s tamed and I can look down upon a fish I’ve dreamed about for many years. I’ve caught Nile perch in Egypt on Lake Nasser but nothing quite like this ‘buffalo’. We weigh it carefully and, after deducting the sling, settle on 114lb. Well, it’s just over, but who’s counting. Two days later the Minister decides he’ll drive for five hours just to join us on the river bank – well, I do now have his mobile number on speed dial! He’s coming along to experience what fishing is all about. As I instruct the Minister how to cast and how to work a livebait along the creases, I cast a glance around the on-looking party. 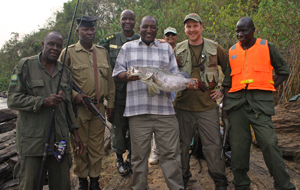 Ignoring the two guards clutching AK47s there’s Patrick Tushabe, Product Development Executive for UWA, Justus Tusuubira, Murchison Falls Conservation Area Manager, there’s a man with a DVD camera, our boat captain and numerous others, too. Talk about surreal. Then Stu hooks into a fish so I hand the Minister over to James while I shoot some pictures. Blow me, I haven’t reached Stu when a shout goes up, the Minister has hooked into a rather large perch, too. Unfortunately it throws the hooks but at least he now knows what makes three dreamers from South Yorkshire want to travel half way round the world to visit his fantastic country. We travelled to Uganda off our own backs. By not using a travel company we literally saved thousands of pounds. Okay, it’s probably not for the totally inexperienced foreign traveller but if you fancy a go, just contact the Sambiya River Lodge direct. They’ll organise accommodation, food, transfers and fishing on your behalf. It’s Friday evening and Sue has a ‘ladies night’ planned. I don’t mind cooking for them but I need to escape the jollities and frivolities of a house full of women drinking wine and competing to see who can talk the most. An email from Pippa Dean rescues me. Would I fancy attending a carp show at the local Holiday Inn? 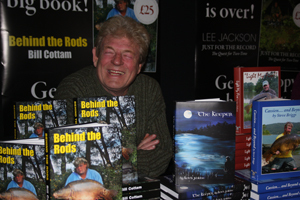 Rod Hutchinson will be around to promote his latest book, Carp Along The Way – Volume Two, Lee Jackson will also be appearing to launch his book, Just For The Record, The Quest For Two-Tone, plus the whole Conningbrook crew will be delivering a slide show and forum. Sounded more exciting than the ladies night, especially when it’s only 4 miles from home. It was lovely to see Rod again. Like the old stagers we are we talked ailments rather than carp. The old boy’s been having serious problems with his eyes this past year but several bouts of surgery later he can see better than ever. The old bugger doesn’t even have to wear glasses now and I’m jealous! Lee Jackson was in fine form. It’s the first time we’ve met since we held those fund raising weekends at Tyram Hall for the ACA. Lee and Jan Porter would jam late into the night on guitars as the likes of Rob Tough, Terry Hearn, Mitch Smith and countless others sat around sharing Chinese food and the odd lager. Rod’s book is fabulous. His sense of mischief and humour shines through on every page and it’s easily his best effort since The Carp Strikes Back. 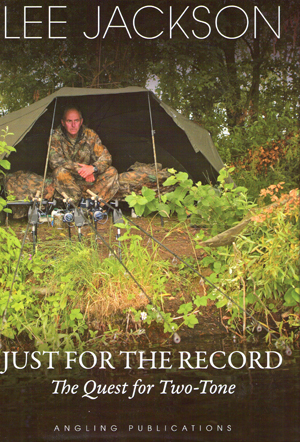 I’ve not finished Lee’s book yet but it’s a fascinating insight into his quest capture the British Rod-Caught Record. Three days after landing back in Blighty I’m in Devon, at Anglers Paradise to be precise. Sue and I have Joined Des and Margaret Taylor for the annual Valentine’s Party. We’re sharing a villa so we’ll laugh a lot but both Des and I have a mission in mind. We each fancy catching a big golden orfe but the weather appears to be against us. 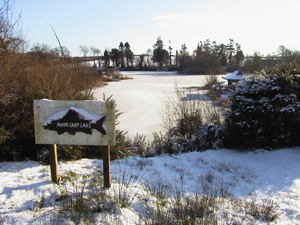 Most of the lakes have iced over wherever the water is sheltered from the wind. Despite this, Des is out at dawn on the first morning. He’s only here for a couple of days and as I’m staying on a bit longer it seemed only fair to let him have the whole lake to himself. Despite the freezing conditions Des fishes half depth and sprays maggots, netting a 5lb specimen in no time. By the time he returns for a late breakfast he’s had two cracking orfe, the second falling to feeder tactics, and a few smaller ones but it was so bitterly cold it took him over ten minutes just to tie on a fresh hook. Back again in the afternoon he drew a blank. The next morning he blanked again. Why was it that the fish fed up in the water when the lake was half frozen over but the minute the ice melted away, so did the fish? My turn now and I was soon wishing I’d not waited. Honestly, the air temperature was up a couple of degrees – positively balmy conditions had you not spent the past week in Africa. I walked round the lake several times, looking for any signs of fish. 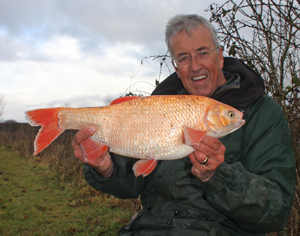 After all, when the water’s clear and the fish you are hoping to catch are bright orange it shouldn’t be too difficult. There were two other anglers on the lake and they blanked, too. I wracked my brains. The fish were obviously in a comatose state. I fished tight to the island point for a good hour. Nothing. I fished tight into a bay. Nothing. I kept flicking maggots into open water, looking for movement. Nothing. I changed swims. Regularly. Seek and destroy wasn’t paying any dividends. In the end I dropped down onto the Float Fishing Lake and caught a fish every cast for a while, just to prove it wasn’t my tackle or my bait that was wrong. The next morning I caught exactly nothing again. I couldn’t buy a bite and I was completely bamboozled. It was the same in the afternoon except by now the wind had blown from all four points of the compass in just four short sessions. On the final morning of my stay I opened the curtains to see the tops of Dartmoor were covered in snow. Clearly the temperature had fallen again. Brrrrr…..! No way was I giving up now. Well, not after I’d eaten a hearty breakfast. Back on the lake I did my best to fish as tightly as I could, placing one of the new Drennan Varyweight Feeders (I really like these)as accurately as possible alternating between the two most likely features but it was to no avail. And then I had a brainstorm, just chuck it anywhere in the open water. That’s right, the place where you never, ever get a bite from these orfe. Five minutes later the tip pulled slowly round and I was attached to my first orfe of the trip. Don’t fall off now! In the cold it fought like a wet rag but the violent head shakes are just as likely to result in a hook pull as those of a Nile perch. Safely netted, it was a cracker! Interestingly it was covered in those little leeches you find on pike when they’ve been laid up for weeks. And guess what? I had another on the very next cast. After that I couldn’t buy a bite again. The action lasted a couple of minutes and then it was back to zero. Zilch. Nothing. Blanking. But this time with a huge grin on my face. Somehow I’d beaten the odds. Trouble is, the harder I try the less I seem to understand. But isn’t that why we go fishing? 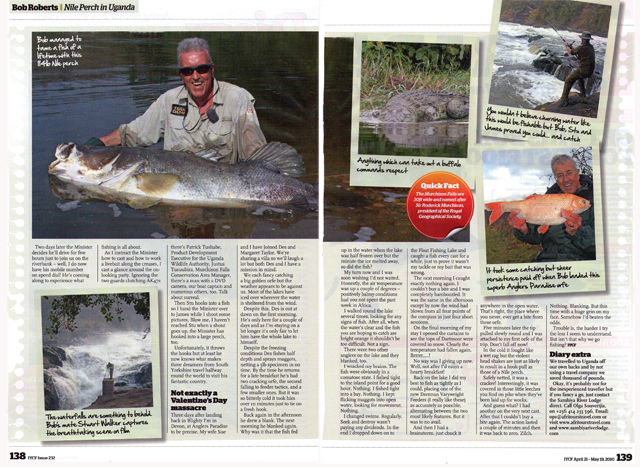 This entry was posted in Foreign Travel, The Vault and tagged anglers paradise, Des Taylor, golden orfe, Improve Your Coarse Fishing, Kev Green, Lee Jackson, Mitch Smith, Murchison Falls, Nile perch, Pippa Dean, Rob Tough, Rod Hutchinson, Sambya River Lodge, Terry Hearn, Uganda, Zyg Gregorek by Bob. Bookmark the permalink.